Through this post on Sprogmuseet about Atkinson’s analysis of the out of Africa hypothesis, I found an article by Ember & Ember (2007) (who also quantified the link between colour lexicon size and distance from the equator, see my post here) on Sonority and climate. The article extends work by Fought et al. 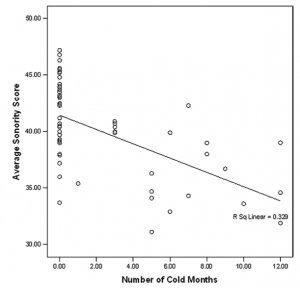 (2004) which finds that a language’s sonority is related to climate. Sonority is a measure of amplitude (loudness) as is greater for vowels than for consonants (for example, see here). 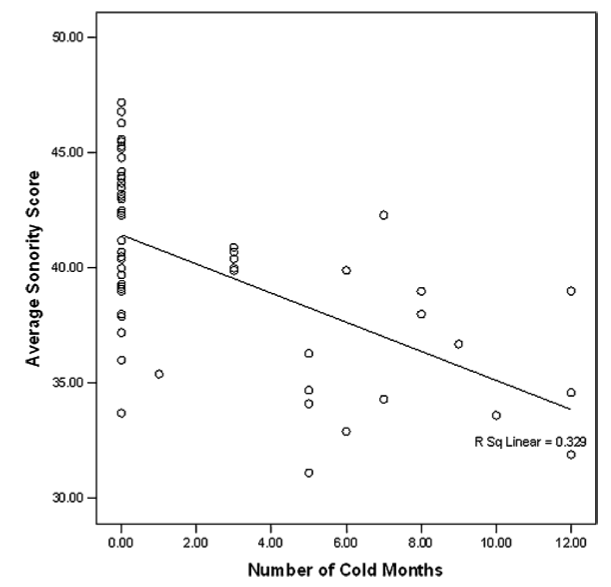 Basically, the warmer the climate, the greater the sonority of the phoneme inventory of the population. The theory is that “people in warmer climates generally spend more time outdoors and communicate at a distance more often than people in colder climates”. That the genetic makeup of a population can indirectly influence the trajectory of language change differs from previous hypotheses into genetics and linguistics. First, it is distinct from attempts to correlate genetic features of populations with language families (e.g. Cavalli-Sforza et al., 1994). And second, it differs from Pinker and Bloom’s (1990) assertions of genetic underpinnings leading to a language-specific cognitive module. Furthermore, the authors do not argue that languages act as a selective pressure on ASPM and Microcephalin, rather this bias is a selectively neutral byproduct. Since then, there have been numerous studies covering these alleles, with the initial claims (Evans et al., 2004) for positive selection being under dispute (Fuli Yu et al., 2007), as well as any claims for a direct relationship between dyslexia, specific language impairment, working memory, IQ, and head-size (Bates et al., 2008). From a purely linguistic point of view, tone is just another aspect of language, and there is no a priori linguistic reason to expect that it would be very stable. However, if linguistic tone is indeed under genetic biasing, then it is expected that its dynamics would tend to correlate with that of the biasing genes. This, in turn, would result in tone being more resistant to ‘regular’ language change and more stable than other linguistic features. Culture-driven population dynamics: sustainable or unsustainable? When looking at culture-driven population dynamics, a common assumption is that there’s a positive feedback between cultural evolution and demographic growth. The general prediction, then, is for unlimited growth in population and culture. Yet models based on these assumptions tend to ignore important aspects of cultural evolution, namely: (1) cultural transmission is not perfect; (2) culture does not always promote population growth. Ghirlanda et al (2010) incorporate these two features into a model, and arrive at some interesting conclusions. In particular, they argue those populations maintaining large amounts of culture may run the risk of extinction rather than stability or growth. Author James WintersPosted on 27 July, 2010 30 July, 2010 Categories Research Blogging, ScienceTags 10, AD, change, cultural evolution, cultural transmission, culture, demography, DOI, evolution, Ireland, Irish Great Famine, models, population, population dynamics, predicting, research, sustainability, Van Foerster5 Comments on Culture-driven population dynamics: sustainable or unsustainable? Now, we all know Brazil aren’t going to win the world cup, but most of us would’ve predicted they’d fare quite well, and possibly win it (my own failed prediction was with Argentina). What’s dubious about the algorithm their using is it predicted Serbia to be finalists! How the hell did they arrive at that conclusion? Well, to give you an indication they do discuss some of the factors included in the model. 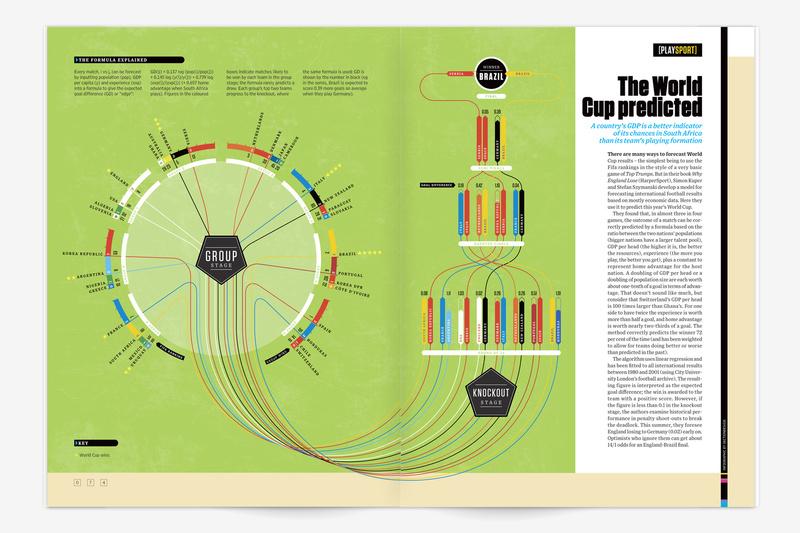 I’ll definitely be coming back to this when I’ve got a spare moment… They did, however, predict Germany would face, and subsequently knock out, England in the last 16.